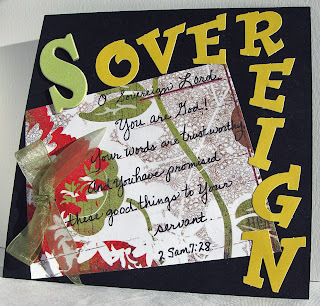 This is my page for His Holy Name Bible Study and Challenge.... Sovereign. I used some Basicgrey designer paper that had some lines on it and hand wrote my verse from 2 Sam. 7:28. The "S" is glittery chipboard, and the other letters are from a scrap pack of perforated letters. It's a simple page but I like how it focuses on the attribute we were studying. If God is not sovereign, we can't claim His many promises... but He IS... and we can! If you'd like to play along, click on the link down the right hand side of this page... His Holy Name! We'd love to have you come along with us on this journey of learning more about our God! This might be my favorite of your four most recent ones. Love the colors of these and His attribute of Sovereignty is so compelling and strong. I love the way the journaling goes over the design of the printed paper. Totally inspired now...in more ways than one. Thanks again, Grace, for coming over to Women to Women: Sharing Jesus. Just loved your comments. Your beautiful reflections helped jumpstart the blog. I truly hope God uses it all for His glory!